The healthcare industry is characterized by high competition, increased cost pressure, and decreasing research and development (R&D) productivity, which is compelling pharmaceutical and biotech companies to make strategic collaborations and outsource their non-core activities. Pharmaceutical, biotech, and medical device players alike are outsourcing processes related to manufacturing, product research, and regulatory process services, among others to contract manufacturing and contract research organizations. This helps them to focus on their core strengths and in turn improve productivity. The global life sciences BPO market is analyzed for various service types such as medical device outsourcing, pharmaceutical outsourcing, and regulatory information. The global life sciences BPO market was valued at US$ 180.4 billion in 2015 and is expected to expand at a CAGR of 12.2% during the forecast period considered (2016 – 2024). According to UBM India Pharma Publication, over US$ 40 billion worth of drug are expected to be off-patent in the U.S. by 2017. Also, in 2014, utilization of generic drugs resulted in savings of around US$ 254 billion in the U.S. This trend is anticipated to increase further with more patent expirations in the near future. 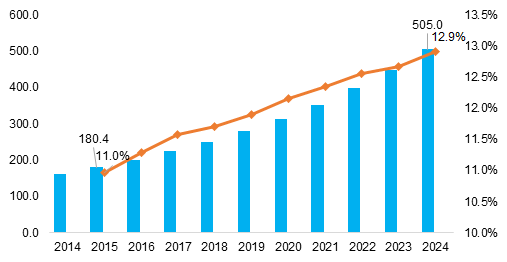 This factor coupled with the advent of biosimilars is projected to favor the growth of life sciences BPO market over the forecast period. Demand for contract manufacturing and contract research services in Asia is high, mainly due to large number of FDA approved drug manufacturing plants in this region. According to the UBM India Pharma Publication report of 2015, Indian accounts for 22% of the overall U.S. FDA approved drug manufacturing facilities globally. Moreover, dynamics such as wide availability of highly trained professionals, cheap labor, large patient pool, and easy availability of subjects for clinical trials are positioning Asia Pacific as a major life sciences BPO market. The life sciences BPO market in this region is expected to expand at a CAGR of 16.6% during the forecast period. Healthcare companies are subject to highly uncertain regulations that change according to country and changing government priorities. For instance, Section 3d of the Indian Pharma Act does not approve any new drug that is an altered form of a known molecule and not representing an improved efficacy over the existing molecule. While this drug is approved in the U.S., U.K, Australia and other countries. Dismissal of such patent applications discourages investment in countries with high growth potential. Also, mandatory licensing and patent ever-greening strategies further makes regulatory filing in a country more complex. Hence, healthcare companies hire regulatory experts of the respective countries to execute the regulatory process smoothly in that particular country. Import and distribution of drug or medical devices in several countries require regulatory clearance that is efficiently managed by life science BPO companies. This enables pharmaceutical, biotech and medical device companies to focus on their core activities such as research, marketing, distribution agreements, and increasing product availability. The regulatory information segment is expected to grow swiftly to reach US$ 35 billion by 2024, on account of increasing abbreviated new drug application (ANDA) filings and growing interest in biosimilars.